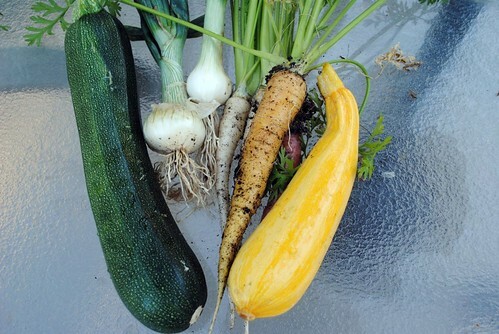 I was able to harvest my first yellow squash along with carrots, onions, and zucchini. I used them for a pasta primavera dish which was the perfect dinner after surviving the first heat wave of the summer. Harvest Monday is hosted by Daphne’s Dandelions. If you want to see what others are harvesting in their gardens check out her site. I keep hoping to see the first blooms on my zucchini, but so far no luck. Yours looks delicious.